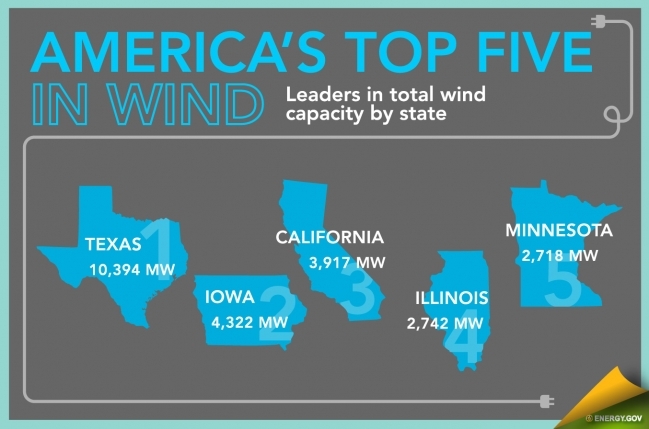 Now only behind China in wind farm energy generation, some U.S. states (below) have farmed the power bonus from this renewable energy source. The states in the diagram below now supply more than 10% of their energy requirements from wind. The U.S. Department of Energy produced a report this week, prepared by Lawrence Berkeley National Laboratory (Berkeley Lab), which outlines the growth and progress made in the American wind energy industry. Approximately 6.8GW of energy generated by new wind turbines was connected to the U.S. grid in 2011. 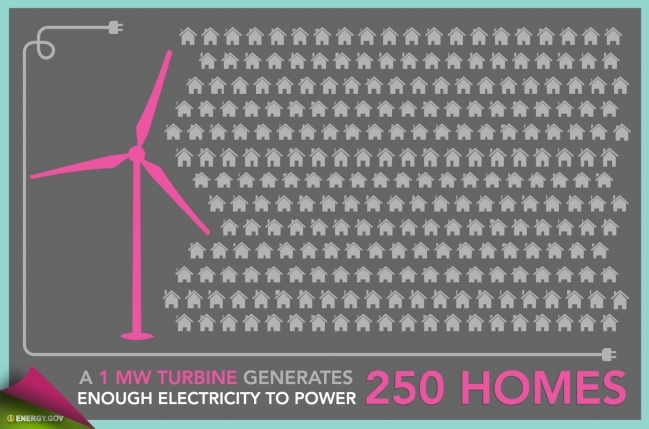 This is more than the 5.2GW added in 2010, but below the 10GW added in 2009. Federal incentives could now be dropped of course, but this too is causing a mini-boom in new installations. 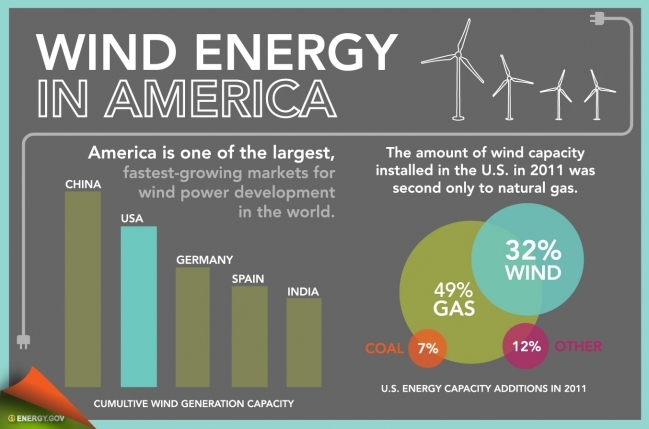 In 2011 the US wind-powered capacity rose to 47,000 and now exceeds 50,000MW! As government has made clear, a progressive approach to American energy and the U.S. wind industry is a critical part of their strategy. Wind energy contributed 32 percent of all new U.S. electric capacity additions last year, representing $14 billion in new investment. That investment is paying off - the bonus is not restricted to power. Jobs opportunities have blossomed as more and more wind turbines are manufactured domestically (67% of all wind equipment in 2011). The export market too has multiplied by a factor of ten in just four short years. As green energy proposals have stated for years, the future job market depends on developing these alternative technologies or 'cleantech'. As overcapacity is likely if incentives are removed, the threat to employment has to be taken seriously. Bigger and bigger turbines have been built while their efficiency has improved and prices have fallen, leading to reduction in prices of electricity from wind. The impetus at the moment is on longer and lighter blades, with performance and efficiency improving with new designs. Other energy sources are still cheaper however, so Federal help will be vital to prolong the new industry's success into 2013. The Obama Administration calls here for the extension of the PTC into 2013. This is the Federal Production Tax Credit. The continued support of clean energy policies such as PTC are critical for America's thriving, competitive wind industry. This illustrates the need to create the high-paying jobs and nationwide economic growth the country needs. Germany and China obviously compete on an equal basis, if some government involvement increases the survival chances of new industry.